Whitefly resistant hedges in Coral Springs & Parkland. Hedges that are resistant to whiteflies. Are you searching for a hedges that are resistant to whiteflies? Whiteflies have become a major issue in South Florida. We have found in the Coral Springs, Parkland and Margate areas some of our homeowners properties have become infected with whiteflies on their Ficus hedges. In the past, Ficus plants have been used to create privacy. Homeowners have noticed their plant leaves yellowing, dropping, covered with white waxy material called flocculent, or covered with whitefly excrement called honeydew and its accompanying sooty mold. Sometimes whiteflies are found on other plants, walkways, cars, outdoor furniture and even pools may become covered with the sticky material or flocculent. Unfortunately, whiteflies are among the many pests that are part of living in a subtropical climate. The good news is that they can be managed with proper plant cultural practices; use of other beneficial insects, mites and fungi; and applications of the appropriate pesticides which can sometimes be very costly. 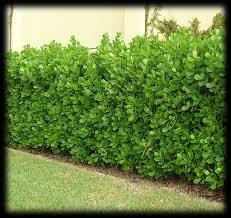 Nobody wants to experience their privacy hedges thinning out and leaving their Ficus hedges weakened or unsightly. 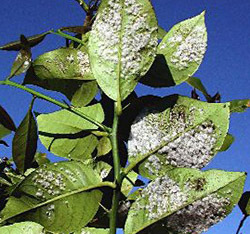 J&J Lawn Service, Inc. suggests that you replace that thinned out, unsightly hedge with a whitefly resistant possibility called small leaf Clusia. Let us replace your ficus with small leaf clusia. Small leaf Clusia is a beautiful plant that is commonly use as a hedge. The small lead Clusia branches grow close to the ground. It produces a densely foliage barrier of stiff, leathery leaves. The Clusia plant will grow approximately 1.5 to 2 feet per year. This species of hedge plant can be easily maintained and is very pests resistant. Unlike the ficus, Clusia are really strong plants. It is a salt and drought tolerant hedge (which is great if you live near the beach). It is also well suited to poor rocky soil and coastal sites. Clusia are a very tropical and medium textured choice, with thick deep green leaves. Clusia can become 20 feet tall, although it is best when kept to 10 feet or so. It is important to note that Clusia is fairly slow growing plant, and can be very handsome. 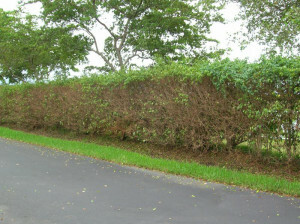 If you would like to replace your thinned out hedges called J&J Lawn Service today at 954-732-5008 and ask for John.